An absolute stunner, 1.00 Carat t.w. brilliant Diamonds are showcased in this gorgeous design. 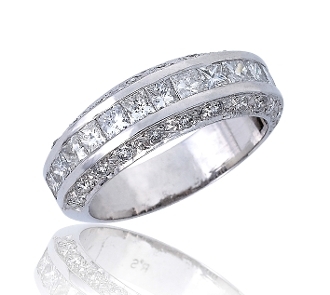 Princess cut Diamonds run through a center channel accented on each side by a row of pave set rounds. Masterfully crafted in highly polished 14 Karat white gold, she is sure to remember the day you say I Do. For added appeal personalize your item, select our engrave option and indicate size needed when adding to cart.